Luke Shaw could become the world’s most expensive teenager beating a record previously set by Wayne Rooney, after Manchester United have reportedly raised their bid for the Southampton left-back to an eye-watering £34m. Shaw, who is set to make his first start in a competitive match for England today when Roy Hodgson’s men face Costa Rica in their final World Cup game, was subject of a £27m offer from United last month, which was swiftly refused by Southampton, who are under no pressure at all to sell one of their stars. 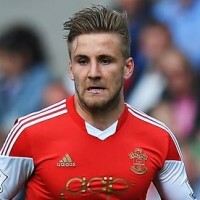 The Saints remained confident to keep Shaw and Adam Lallana at St Mary’s ahead of next season, having already parted ways with Rickie Lambert, after the England centre-forward was allowed to join Liverpool just before the World Cup and have told Brendan Rodgers he’ll have to fork out at least £30m if he’s to bring Lallana to Anfield. Shaw has been on United’s radar for a while now, after an outstanding Premier League season saw him break into the England team, and despite interest from Chelsea – the left-back’s childhood club – the Reds looked poised to win the race to the 18-year-old before the World Cup kicked off in Brazil but, over the last two weeks, the deal looks to have stalled. According to the Mirror, however, United have now upped the ante and are ready to pay £34m for the promising left-back, just three millions short of the £37m the club shelled out in January when Juan Mata became the club’s record signing. With Patrice Evra penning a new 12-month deal earlier this month and Alex Buttner on his way to Dynamo Moscow, United are in serious need of a new left-back and Shaw’s talent and age make him an excellent signing, but the £34m looks ridiculously steep for a player who’s still largely unproven at international level. Much like with Chris Smalling and Phil Jones, United look set to be forced to pay the “tax” Premier League clubs are always eager to apply to talented young English players, even though Louis Van Gaal might still decide he’d be better off investing on another, cheaper, left-back and use part of the money for a different deal.